Prove you're a professional to your next student, by showing your certificate of insurance. This can help you win additional students, by showing you can compete with even serious tutoring centers. And of course your ability to quickly and easily email your certificate will make parents trusting you with their child's education more confident in your ability to do your job. You can work on making sure your students succeed, knowing that your tutor insurance is handled. So go on and make your dreams come true, whether that means working in different areas, taking on more hours, or adding a new skill to your offering. You can pay for your tutoring insurance monthly, at no extra cost. We know your business cash flow varies and that a lump sum just isn't convenient. That's why we don't charge extra for you to pay in a way that works for you. We don't charge any other extra fees, either. A child slips and falls on their way into a lesson with you. As a result, they get a concussion and have to go to the emergency room. You accidentally break a child's expensive violin, and their parents demand $5,000. A client trips over a rug in your office and sprains their ankle. Therefore, they make a trip to the emergency room. Afterward, they ask you to pay for the $3,000 medical bill. You use an unflattering photo of a student in your marketing materials and their parents sue you for violating their right to privacy. The parent of one of your students claims that your teaching of their child was not effective, and hampered their development. They bring a lawsuit against you. How does Live Certificate work? So far, so good with this company! I love that I can make monthly payments for my home daycare business. It is vital for me to have liability insurance and it is not always easy to get. When I needed customer service in my process of signing up, I called the number listed & immediately got very good help! I have just started my own family Childcare business. I needed insurance to get my license. My current homeowners insurance wouldn’t even talk about it. They just flat out said “NO”! 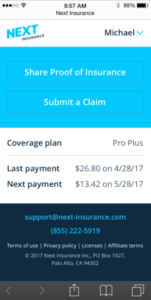 I found Next Insurance on line. The whole process was easy and the payments are very reasonable.